The government of Cross River state has resumed clearing precious rainforest land as part of the construction of the superhighway. While some community members are losing their forest and properties, others are advocating for their right to their land. Individuals and members of civil society stand in solidarity with communities in the face of the continued works. In October 2018, the government of Cross River State resumed work on its proposed superhighway in Okuni located in Ikom local government area (LGA). This is just one among several communities in the state that have felt the impact of the proposed superhighway linking Calabar to Benue State. Already homes and forest areas have been cleared out and livelihoods destroyed without any compensation or prior negotiation. The superhighway is the pet project of Governor Benedict Ayade, initiated in 2015. The initially proposed superhighway covers a distance of about 275 kilometres with a width of over 25 kilometres. It will use about 5,200 square kilometres of land affecting over 600,000 people in 185 communities. Originally budgeted at ₦800 billion, the superhighway was later revised to cost ₦200 billion to build. Regardless of the reduced amount, the project will push Cross River State further in debt. From its inception, the Cross River superhighway affronted many rules and laws of the Nigerian federation, such as the Land Use Act of 1978. Firstly, it started without any proper consultation with the many residents who live around the forest and along the path of the superhighway. Then, there was initially no Environmental Impact Assessment (EIA) undertaken, a mandated requirement for any project of this size which is bound to affect the environment and ecology of the state. In October 2015, President Muhammadu Buhari performed the groundbreaking celebrations thereby officially launching the commencement of the project. Thus the Cross River superhighway began despite the fact that the land for it had not been properly acquired through legal means. Through the efforts of individuals, communities and civil society, the Federal Government brought the work on the superhighway to a halt in 2016. The Federal Ministry of Environment and the National Environmental Standards and Regulations Enforcement Agency (NESRA) were brought in to supervise the production of an EIA on the superhighway. From late 2016 to early 2017, the government of Cross River State attempted four different EIAs, all of which were substandard according to Odey Oyama, Executive Director of the Rainforest Resource and Development Centre (RRDC). 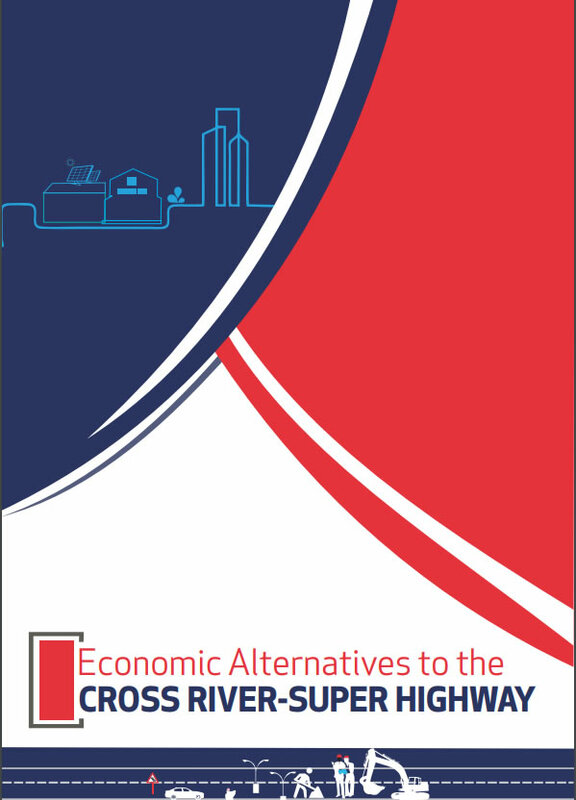 Take for example the first EIA stakeholders’ meeting which, according to Oyama, was held in Abuja; far away from the area and communities that the project was going to impact. It was not attended by members of the civil society or local communities. Nonetheless, the government of Cross River State was given a provisional EIA approval. As part of this understanding, the state government is to meet 23 conditions before commencing the work on the superhighway. One of the conditions is to pay compensation to people and communities displaced by the superhighway. Although most communities are yet to be compensated, ₦20 million has been made available by the state government to one community affected by the destruction. While this is positive news a number of civil society members say they are not clear what the compensation is for as no detailed assessment on how the amount was reached has been made available to the public. The amount was disbursed through the RRDC to communities between December 2018 and January 2019 with the final disbursement happening this month, March 2019. However, the distribution of the sum was left at the discretion of those that received it. Communities in the mangroves are yet to be compensated. The construction of the superhighway is also of utmost importance to environmentalists in Nigeria and across the world as it directly threatens several forests in their original design. The rainforests in Cross River State are among the last remaining in Nigeria and are home to a number of endangered flora and fauna. The Ekuri forest alone traps about 7,000 metric tonnes of carbon each year and plays an important role in climate change mitigation. The people of Ekuri depend on the forest for medicinal, economical, cultural, spiritual, and other reasons. There are already two existing highways that connect Calabar and Benue State. Should the Cross River State government choose to work with the Federal Government to fix and/or expand either of these highways, it would have no negative impact on the rainforests or the people that reside in it. Both local and international organisations involved in environmental and land issues are paying attention to what is happening in Cross River state. 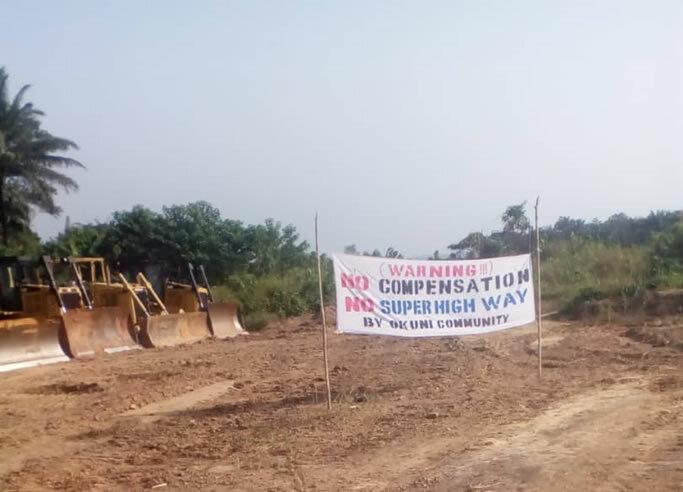 Environmental activists such as Martins Egot, who works closely with forest communities, joined efforts against the Cross River superhighway when bulldozers appeared around communities. Egot states that a lot of damage is going to be done to the environment due to this superhighway while emphasizing that the project revokes the right of the indigenous people who own the forest. Through his organisation RRDC, Oyama has filed several litigations against the state government as well as launched numerous writing campaigns to the state government and presidency. Since October 2015, the RRDC commenced a sensitisation project aimed at people living along the superhighway corridor. This was done in an attempt to mobilise communities and inform them of their rights under the Nigerian Constitution. Communities erroneously believe that the land belongs to government and Oyama sought to enlighten them that according to the Constitution, the land belongs to the people. It is due to this, he says, that the government has to acquire land before starting anything. The RRDC got the right of attorney from the communities mandating them to fight a legal battle on their behalf. So far, this has been successful. The original 20 kilometre corridor (10 kilometres on both sides of the road) required by the planned superhighway as a buffer zone has now been reduced to 70 metres. The path of the superhighway has also been diverted away from the National Park and other areas of conservation interest following a hearing session in 2017. 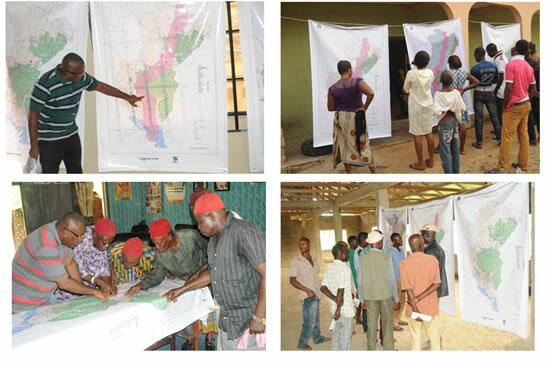 Meanwhile, the NGO Coalition for Environment (NGOCE) has been developing a Participatory Land Use Plan (PLUP) with communities in Ikom and Obubra local government areas. While in Akpabuyo LGA, the organisation has helped communities to develop Forest Management Plans (FMPs) and Community Forest Laws. It has also done some work in enhancing the management of natural resources in the forest. One possible setback to efforts is that there is yet to be a collectively organised action by civil society. Currently what we see are individual organisations working in the communities they are present in. There is a need for stakeholders from the government, communities, civil society as well as the private sector to come together and be involved as one entity against the superhighway. When work began in Ikom LGA earlier this year, it was also slated to take place in Etara. However that did not happen due to protest from the community with support from the Ekuri Eyeyen community. People affected by the superhighway are not happy with the government of Cross River State as they believe their needs and concerns have not been met. There stands to be an aggravation of poverty levels in the state due to the government taking land from already impoverished people. For residents in the forest, the forest is a source of economic livelihood and revenue generation and the government clearing the land and removing people en masse from the forest takes this opportunity from them. “The destruction of property has rendered certain people homeless, they are being displaced and have nowhere to go” according to Umo of Peace Point Development Foundation. They are now just waiting for when the government will come and assist them. As the superhighway continues undeterred, activists like Egot believe that it is solely aimed at draining the remaining rainforest to the financial gain of individuals who stand to sell timber. For Oyama, the future needs more actions against the government. Under the Freedom of Information Act the state government should be compelled to release a compilation of all communities to be compensated, as well as information on the superhighway diversion as designs have not been made available to the public. More advocacy is needed to find out why the state government got a provisional approval for its EIA from the Federal Ministry of Environment. Vincent Ayang of NGOCE reminds us that protecting forests and natural resources does not necessarily mean that development should elude local communities. This project could be implemented in a way that limits the damage to the environment. The government of Cross River State could develop alternative ways of serving its most vulnerable people and empowering them economically. Ayang suggests that civil society initiates hands-on activities like tree planting, restoring degraded forest patches and other agroforestry activities to protect the natural environment of Cross River State.